This lightbox with a wood grain-inspired frame provides a touch of vintage cinema charm to your home. Transform your home, parties, and clever turns of phrase into feature film-worthy displays with this lightbox featuring a wood grain-inspired frame. Back-lit like a real marquee and framed in dark wood laminate, this lightweight, battery-operated design offers two slotted lines to accommodate the included letters and symbols. Set up this portable piece in your entryway to welcome visitors, in front of a birthday cake, or as a fun addition to your entryway decor, and let the creative messaging begin! Made in China. Vintage Lightbox includes a total of 140 letters, numbers and characters. See what's included here. Includes a combination of 140 letters, numbers and characters. Powered by 9V 500mA adapter (not included) or 6 AA batteries (not included). 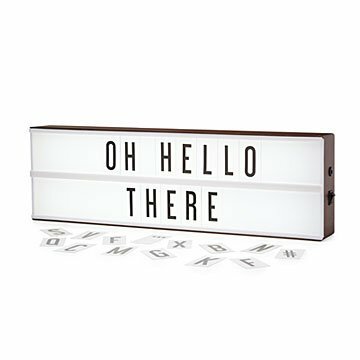 The My Cinema Lightbox - Vintage Edition fits the same letters as our Original Lightbox. The lightbox is really cute in our lobby! Unfortunately we had some difficulty getting the thing to turn on! The battery channel was really tight & the spring wasn't making good contact with the batteries. I actually returned the item thinking it was defective! The new one did the same thing so we adjusted the battery spring & it started working. Great Product, has everything it promised! It works great! Looks great! It would help to be able to plug it in. I love it over-all, everything looks great! I just wish there was an option for a bigger sign. Good amount of letters provided to make messages. Maybe a storage bag for letters could be included but can just use a baggie. This is my second time ordering from uncommon. I love the quality of the products.